Item # 304023 Stash Points: 1,199 (?) This is the number of points you get in The Zumiez Stash for purchasing this item. Stash points are redeemable for exclusive rewards only available to Zumiez Stash members. To redeem your points check out the rewards catalog on thestash.zumiez.com. 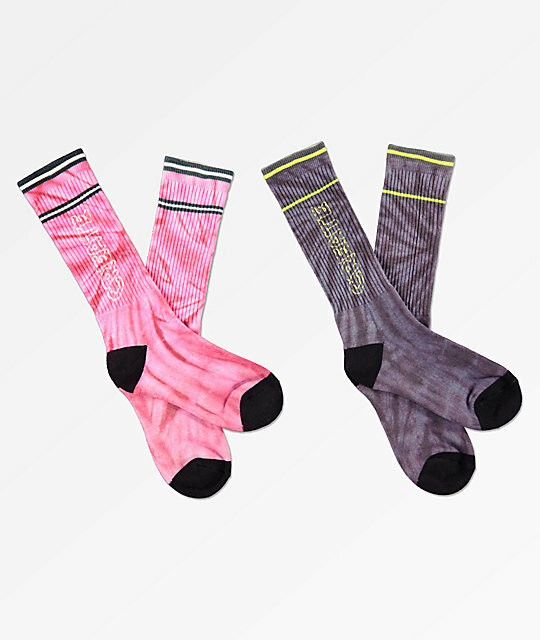 Stock up your sock drawer with the Tie Dye 2 Pack Crew Socks from Create. This sock bundle comes with two pairs of tie dye socks with contrasting stripe details and Create logo graphics for signature style and daily comfort. Tie Dye 2 Pack Crew Socks from Create. Pair 1: Pink tie dye with Create logo graphics. Pair 2: Grey tie dye with Create logo graphics. Contrasting toes and heels on both pairs.